About Us - The Association of the Oldest Inhabitants of D.C.
Don’t Let Our Name Mislead You! We’re a vibrant organization for young and old alike. As Washington’s oldest civic organization, we’re dedicated to preserving D.C.’s heritage. Our programs feature history, civic improvements and business recognition. "...to keep alive the reminiscences of the past and the social and paternal communications of the present and future... in an effort to restore the capital’s dignity plagued by lingering and divisive sectional loyalties following the Civil War." By-laws and constitution, December 7, 1865. "The Association of the Oldest Inhabitants... has, against all logic been born again. Or, at least, become younger, more inclusive and more vigorous. It is Washington’s living archive..."
Sara Booth Conroy, The Washington Post, Aug. 30, 1993. "...this Association’s...main function is reminiscent and preservative. It fosters the loyalty of the Washingtonian to Washington, the self-respect of the Washingtonian, and the affection and pride which he feels in his own and the Nation’s Capital." Theodore Noyes, President, Dec. 7, 1907. 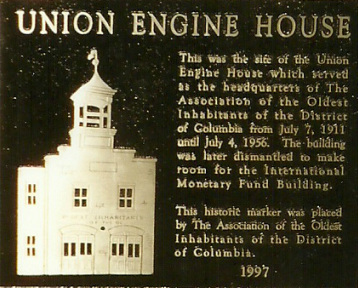 While few members remain who recall the days when the AOI was headquartered in the old firehouse at 19th & H Streets, NW (now the location of the World Bank), many still hold dear the history the AOI has with the (now-defunct) Veteran Volunteers Fire Association. Today, several AOI members are retired from the DC Fire Department and are active in maintaining our working relationship with the agency, including the safe storage of our antique fire apparatus. Learn more about the history of D.C. Firefighting, visit the Friendship Fire Association Museum. This plaque appears in the lobby of the International Monetary Fund/World Bank building which now stands at the location of the AOI's old headquarters at 19th & H Streets, NW. Read WAMU-FM's Mikaela Lafrak's "D.C.’s ‘Oldest Inhabitants Association’ Is Not As Stodgy As It Sounds" or listen to the audio once you've navigated to their site. > Works to preserve the District's historic records (DC Archives, Washingtoniana Division of the DCPL, the Sumner School Museum & Archives, the Kiplinger Research Library of the HSW and the Recorder of Deeds). Additionally, for 108 years, the AOI maintained a unique collection of antique firefighting apparatus and memorabilia which was turned over the Friendship Fire Association Museum in August 2015. After the AOI sold its 19th Street Fire House Headquarters (pictured left) to the World Bank in 1955, the Heurich House served as AOI's headquarters until 2006. See a photo of Washington brewmaster Christian Heurich at an AOI meeting at the old Union Fire House on July 4, 1944. 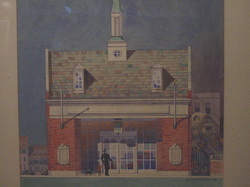 In 1958, congressional legislation was passed that would have given the AOI the right to purchase an old fire house in the 3200 block of M. Street, NW to become its headquarters. It is far too long a story to go into; however, needless to say, the transaction was never completed and the architect's rending of "The AOI's New Clubhouse for Georgetown" (pictured) never came to fruition. Today, the AOI conserves its financial resources and exercises its fiduciary responsibility by not being encumbered with property ownership or rents. Read the Washington Post's John Kelly's account of the demise of AOI's historic Union Fire House: An old D.C. firehouse gets taken apart, then lost (Harry Goodwin/ The Washington Post ) Sunday, July 7, 2013.